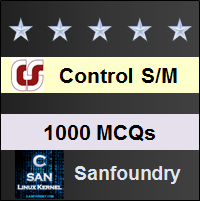 This set of Control Systems Multiple Choice Questions & Answers (MCQs) focuses on “Concept of Stability”. Explanation: Stability of the system implies that small changes in the system input, initial conditions, and system parameters does not result in large change in system output. Explanation: A system is stable only if it is BIBO stable and asymptotic stable. Explanation: Asymptotic stability concerns a free system relative to its transient behavior. Explanation: BIBO stability concerns with the system that has input present. Explanation: If the system is given with the unbounded input then nothing can be clarified for the stability of the system. Explanation: As the output exceeds certain magnitude then the linear mathematical model no longer applies. Explanation: For non-linear systems stability cannot be determined as asymptotic stability and BIBO stability concepts cannot be applied, existence of multiple states and unbounded output for many bounded inputs. Explanation: The impulse response must be absolutely integrable for the system to absolutely stable. 9. The roots of the transfer function do not have any effect on the stability of the system. Explanation: The roots of transfer function also determine the stability of system as they may be real, complex and may have multiplicity of various order. Explanation: Repetitive roots on the imaginary axis makes the system unstable. Explanation: Roots on the imaginary axis makes the system marginally stable. Explanation: If the roots of the have negative real parts then the response is bounded and eventually decreases to zero. Explanation: The impulse response of the system is infinite when the roots of the characteristic equation has positive real part. Explanation: A system can be stable, unstable and conditionally stable also. 15. ___________ is a quantitative measure of how fast the transients die out in the system. Explanation: Relative Stability may be measured by relative settling times of each root or pair of roots.